I was invited to deliver the 6th annual Distinguished Workshop Series presentation at the 2014 American Psychological Association’s convention in Washington DC on August 8, 2014. I am incredibly honored (and humbled) to be associated with former DWS presenters including Drs. Judith Beck, Bruce Wampold and Bessel van der Kolk. 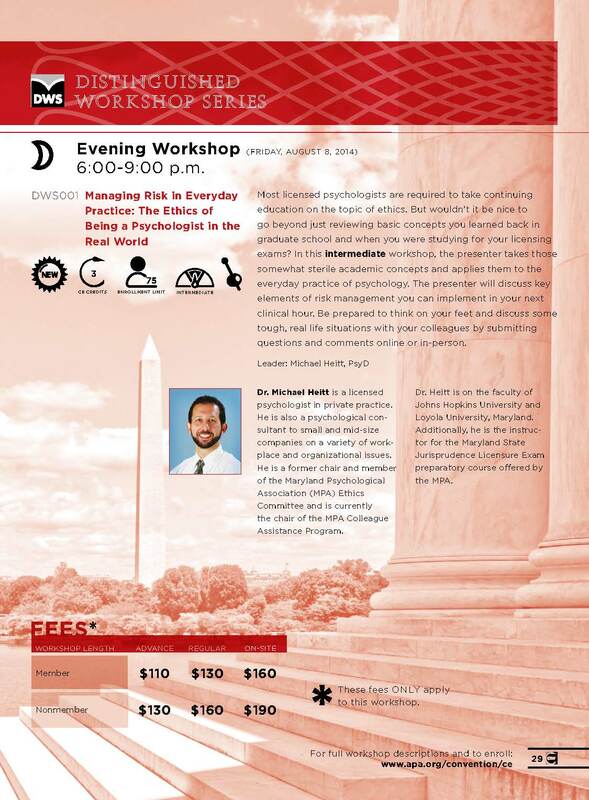 I will be offering a repeat presentation, entitled, “Managing Risk in Everyday Practice: The Ethics of Being a Psychologist in the Real World,” a three-hour, interactive workshop that I’ve given at Maryland Psychological Association’s Ocean City Institute in 2013 and at a Clinician’s Corner continuing education webinar through APA earlier this year. Come on out to the DC Convention Center, have some hors d’oeuvres and discuss some tough, real-world ethical issues that psychologists face.